Are you a fan of ombre? I am. I love this look on walls, papers, dresses…and, of course, ombre wedding cakes. This yellow ombre cake is one of the prettiest examples of the technique I’ve seen. It’s really subtle, with just a kiss of color toward the bottom, for the couple who really like the idea of a white cake, but want just a tiny touch of color. The darling cake topper, consisting of a compact nosegay of yellow roses and other flowers, perfectly punctuates the look. Beyond the ombre, aren’t the buttercream ribbons that adorn the cake fantastic? Look closely, and you’ll see that the effect mimics the gradual increase in size of the layers, and each “ribbon” is trimmed with dots of buttercream. Simple but perfectly executed. What a pretty cake. 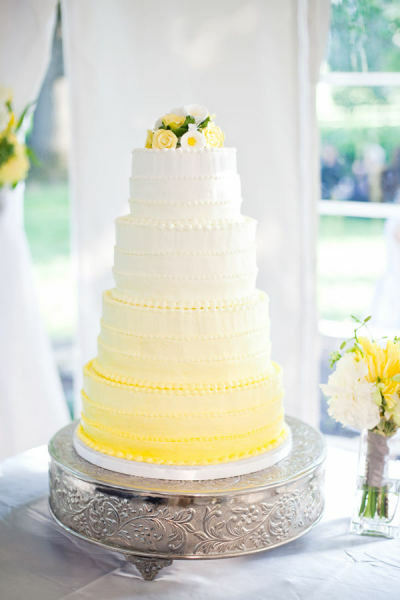 We couldn’t find the name of the artist for this beautiful cake, which was originally shared on Style Me Pretty, and photographed by Martha Locklear. If you know who created it, please share!